A range of local enterprises have been honoured at the fourth annual Belfast Media Group Business Top 50 event. The awards, which took place at Stormont on Thursday, celebrated a diverse range of entrepreneurs and business leaders from every part of the city. Among the well-known names on the list were hotelier Bill Wolsley, restaurateur Michael Deane, John McCann of UTV, Shankill Mirror managing editor John McVicar, artist Rita Duffy and social entrepreneur Gerry Ward. A special accolade, sponsored by Invest NI, for companies that have completed the Invest NI Go For It programme went to the Suki Tea Company. Also honoured by the event’s premier business sponsor BT for the best use of ICT in business was entrepreneur Mark Finlay of Barnabas Ventures. Noel McKenna of APT picked up the KPMG Award for Business Vision and Growth while social entrepreneur Gerry Ward and Hughes Insurance were also recognised. Guest speaker at the event was Social Development Minister Margaret Ritchie. 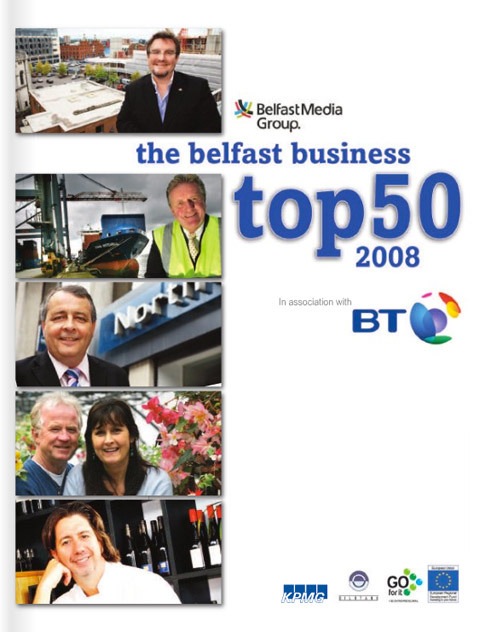 “As award ceremonies go, I like the fact the Belfast Media Group Top 50 is a bit different. “It manages to shine a spotlight in equal measure on the multi-national and the small to medium-sized enterprise – that is what makes these awards special. “It also highlights the success of local people. That helps to raise awareness, particularly among our young people, of the successful entrepreneurs that have hailed from their street or district. Michael Cunningham, head of business sales for BT, said the awards brought together local government, business experts and owner-managers. “They celebrated their achievements, but were also able to discuss the triggers and barriers to long-term successes for the small business community. West Belfast MLA Jennifer McCann, deputy chairperson of the Executive’s Enterprise, Trade and Investment Committee, welcomed the diversity of the awardees. “We had people from all walks of business, including well-established business giants developing alongside emerging start-ups from all over the city. “Working together, we can add significant value to local economic development growth and create opportunities for all in the regeneration of this city. “The enterprising individuals who were honoured at this event have a vital role to play, as they are the ones that will come up with the winning ideas that will be converted into a competitive advantage for our local economy.